You are currently browsing the Pontiac Paradise Shop Talk weblog archives for January, 2011. New Repro GM Ball Stud!!!!! 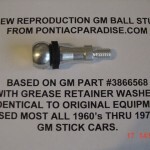 NEW Reproduction GM Ball Stud for 60’s - 70’s GM Stick Cars!